Happy Mother’s Day (a day late) to my beautiful wife and Ben’s mom! It seems even babies who can’t see know when you have your video camera out, otherwise I would be able to share with you a very exciting video of Benjamin going from the floor to standing up without any support! He did it a couple of times in a row last night but we couldn’t get him to repeat it once we had a camera on him. So you will just need to take my word for it. 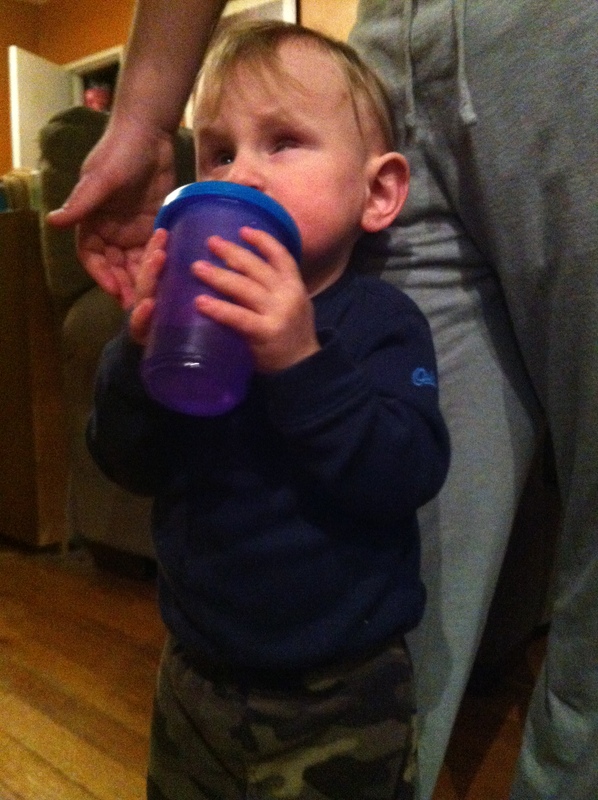 He also has been letting go of things and standing unsupported for longer than ever before. It made us so happy to see him standing clapping and smiling today for like 20 seconds. Normally he will wobble over pretty fast, or lunge towards us, or make a fun game of falling on his bum. 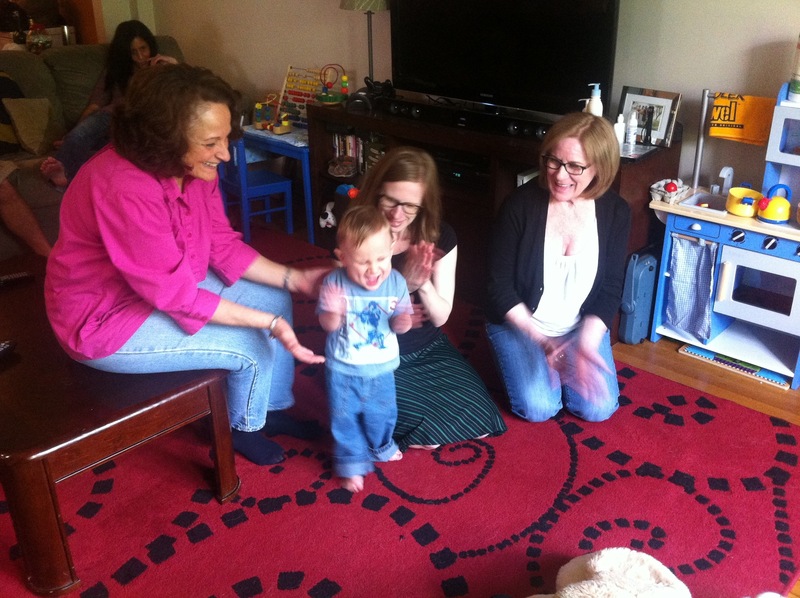 Ben is also in nonstop motion – climbing up his giant stuffed dog onto the couch or moving around his toys or the furniture in a cruising/rolling/falling/climbing combo. Good thing he’s tough though – he ends up banging his head a lot. So while last week was a lot of fun with all kids- there is one things kids do better than anyone else: spread germs. 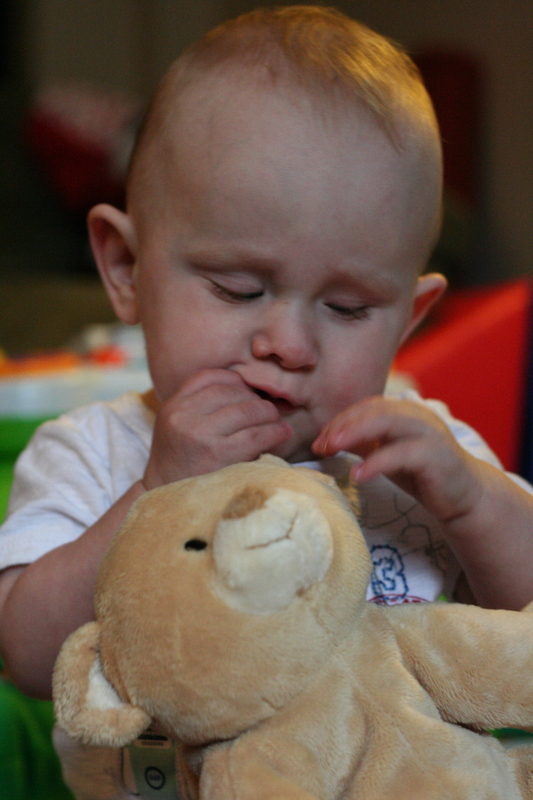 By the end of the week every little boy in the house, including Benjamin, were snot monsters. Boogers flowing freely like… well… gross viscous rivers. Ever see Ghostbusters 2? Like that. For those keeping score this is Benjamin’s first cold. To make it this long it has taken gallons of purell (not to mention a few months of living in a plexiglas box). 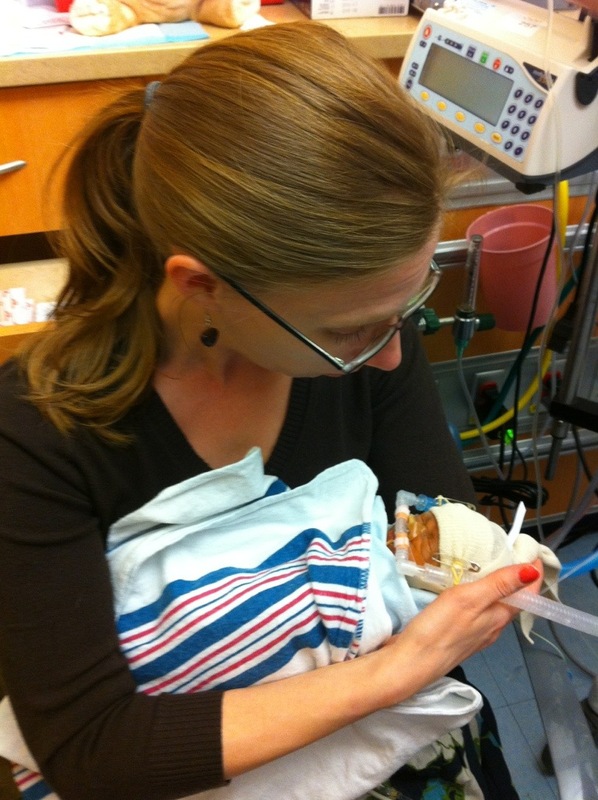 So far it hasn’t been so bad – he’s pretty stuffy and a little bit cranky, but no fever and only a little coughing. The doctor didn’t even want to see him. This is quite a change of pace from when he used to get put on 3 antibiotics and have a full blood work up if someone said “cold” near him back when he was in the hospital. That said, we hope the cold goes away soon. Being sick is no fun (and he’s been sleeping poorly through all this). Ben’s spasms have really been improved by the vigabatrin. Only a few days after he started taking it the spasms are virtually gone. The only lingering weirdness is at night. We have caught him a few times with spasm-like movements in his sleep. Nothing like he used to have, but it is still not great. 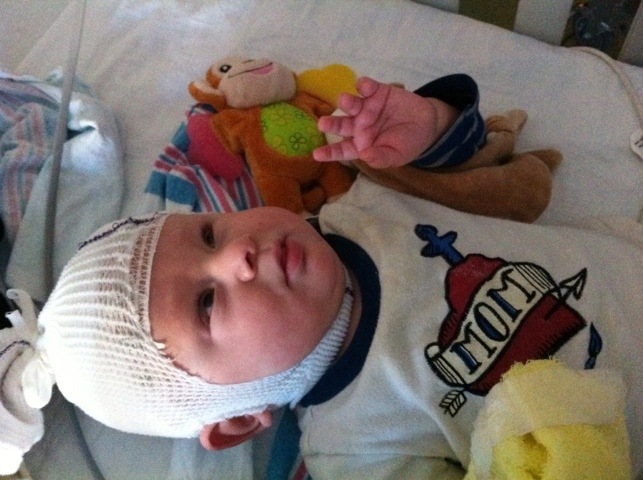 Anyhow – we’re hoping that goes away or maybe following his next EEG they adjust the dosing and make him 100% spasm-free. As for eating – can you believe the boy who would only eat if you were sitting in his glider, with the lights off, the sound machine on and if he were 85-90% asleep, had his best feeding week ever while we were in OBX? Incredible! He even finished full bottles in rest stops! All this eating had him gain a half a pound so – making him now over 15 and a half pounds! Where does that put him on the chart? Well – not quite on it yet. Maybe if he keeps eating we can get him up to 1%. 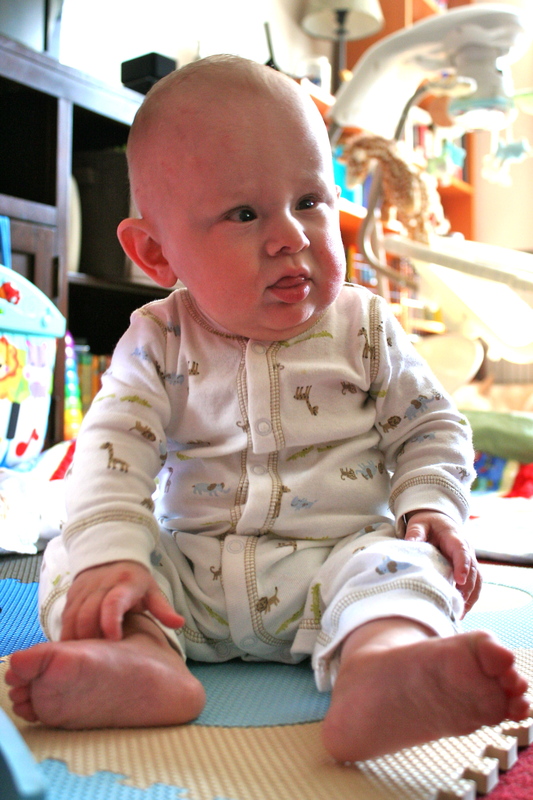 And lastly – he is completely sitting up on his own now. You lay him down on the ground, turn round, and there he is sitting up! How did he do that? It has been very frustrating, but we are finally getting Benjamin’s seizure meds today. We’re hoping they work and they won’t have to try one of the meds with more side effects. As we said last time, the Vigabatrin (Sabril) has one pretty nasty side effect (possible vision loss) but the other options aren’t much fun. 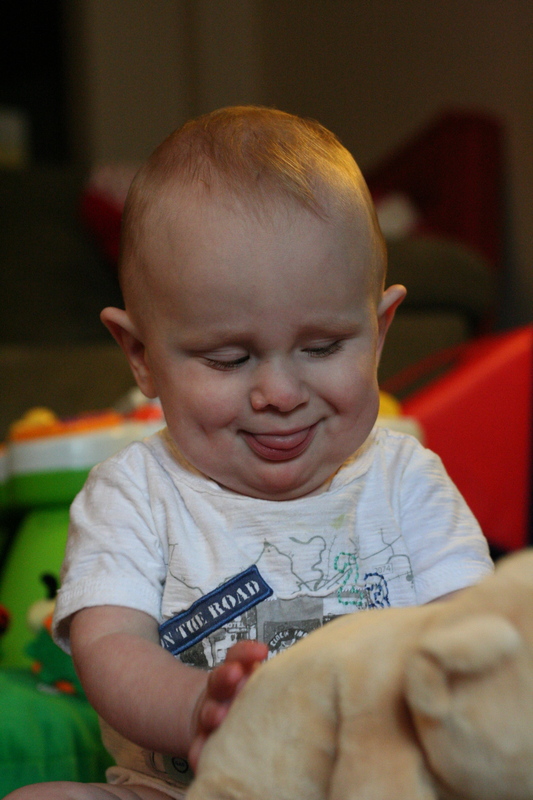 The vigabatrin works for a lot but not all babies with infantile spasm – fingers crossed. 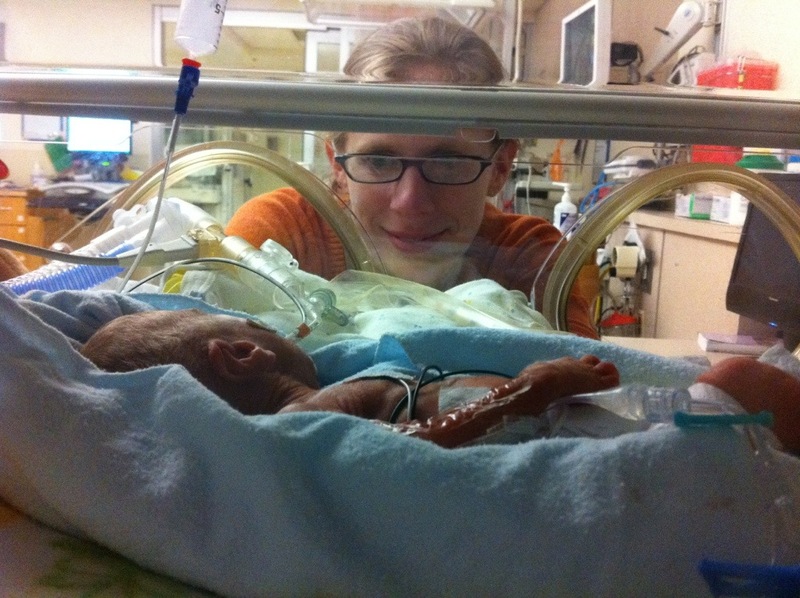 In about a month they will bring Ben back in for an overnight EEG and hopefully see improvements in the waves. I just want to see the spasms stop – they are heart breaking. Especially because they scare him and he gets upset. 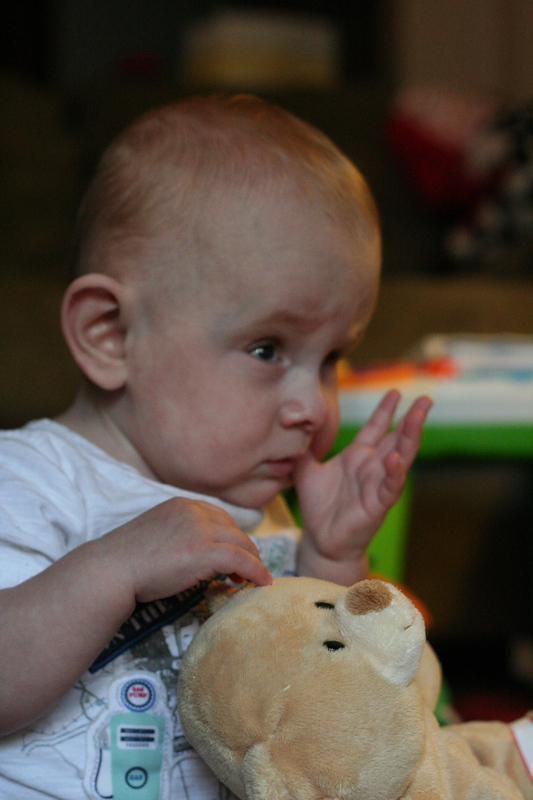 In other news, even with our stay this week, as of yesterday Ben has been home longer than he has been in the hospital! And remember how I said I was going to write post about how much Benjamin likes peas? 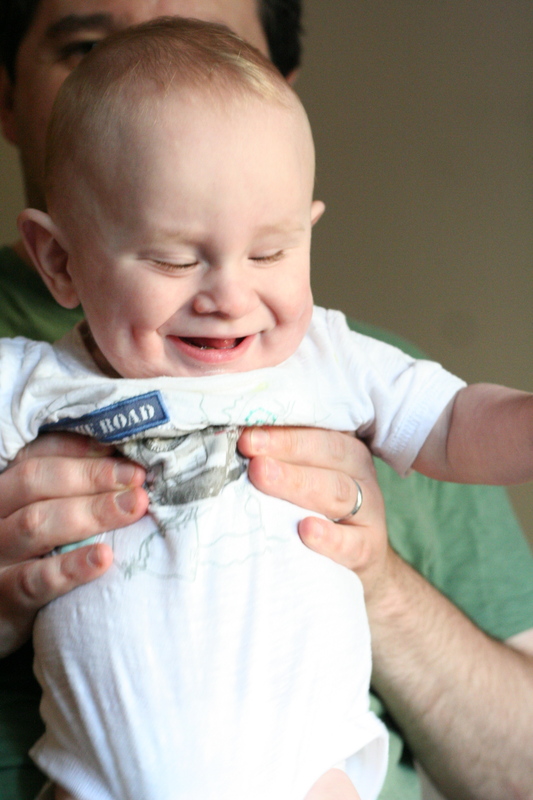 He also likes chicken and rice and has been really good eating solids. It is amazing, especially since he gives us such a hard time with a bottle most of the time. 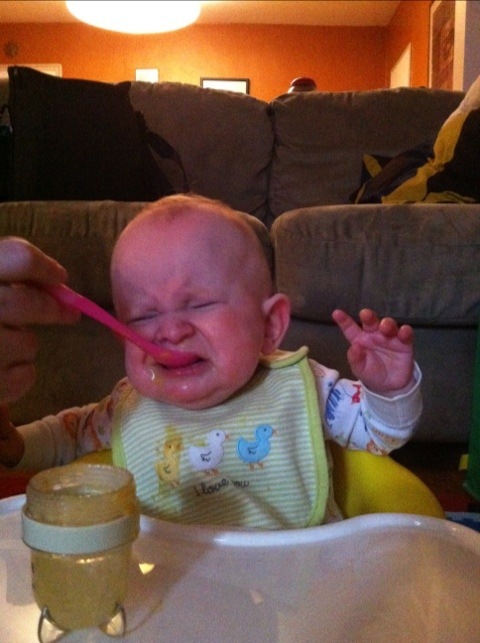 This photo is from this morning and while it looks like he is upset – he’s really just biting the spoon with gusto! So I’m not going to lie – it’s scary stuff. You know it’s not good news when the doctors recommend you don’t google something. After two nights on the EEG, the doctors told us that what Benjamin has is called “Infantile Spasms” (sometimes called “West Syndrome”). It’s a form of epilepsy that is pretty rare and shows up around this age. What it looks like is his head dropping towards his chest and his legs lift at the same time – it only lasts a half a second and then he’s normal for a bit and then he spasms again. This happens 10 to 20 times over the course of a few minutes and then it is over. It sometimes really upsets him too (and us). It can be caused by a ton of things, but in Benjamin’s case it is likely because of the brain injury from his inter-cranial hemorrhage (in the occipital lobe and the cerebellum). The scary part you read about if you do google it is the long time diagnosis. There is a big connection between infantile spasms and developmental problems, especially low IQ. There is also possibly an increased risk of death (though that might be less of an issue with medical advances). Some things say if you treat it early the risks for these things are less. And hopefully we caught it early. And since the causes of the spasms are so wide, it’s hard to say what any individual kid’s outcome will be. And come on – this is Benjamin we’re talking about. He laughs at percentages and scary google results. He is going to be fine. The doctors are recommending (and we agreed) to treat him with a drug called Sabril that we are hoping will work. The one big side effect of the drug however is the potential to damage vision – so no big worry there. He’ll start taking it soon once it arrives (for some reason it is difficult to get) and hope it will work quickly and completely. Another quick update to let you know Benjamin is on his way home. 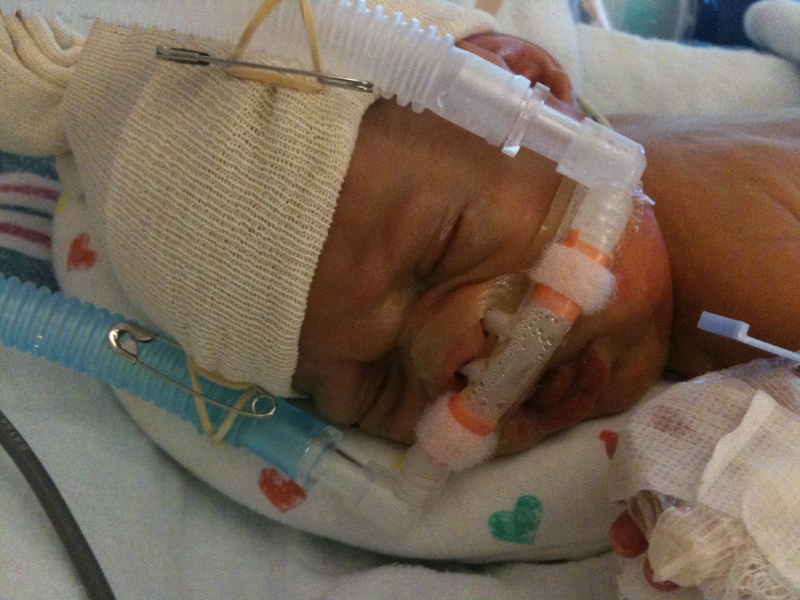 I will write a longer post about what the doctors learned and what that means for Ben. The short version is he’s getting anti-seizure meds that should help and we’re glad we went in sooner rather than later (thanks for the push Grandmas).